Problem: Create black and white figure-ground compositions (stable and ambiguous) using the simplified forms observed within the bounds of your home window (frame). Materials: Creative Process Book, pencils, marking pens, 1 sheet Bristol Board 9×12″, 1 sheet Bristol Board 14×17”, black drawing paper, scissors, exacto knife, ruler/t-square, glue. Technical Skills: thumbnail sketching, draughmanship with ruler/t-square, inking pens, exacto knife and collage. Choose a spot in your apartment and let the window ‘frame’ the view from that spot. Write on the 3rd page of your Creative Process Book: ‘A View From My Window’ and compose a minimum 2-paragraph description of the view. Focus on describing the shapes, lines, points and their relationship to each other. Ignore everything except what you see inside the boundaries of the window frame. Refine this description and add it as a reply to the OpenLab discussion topic Assignment 1 Research. On the following page(s) of your Creative Process Book make at least 12 thumbnails of the view in pencil. Do not shift your position. Draw whatever you see. Draw quickly, without thinking or worrying about the quality of the drawing. JUST DRAW! 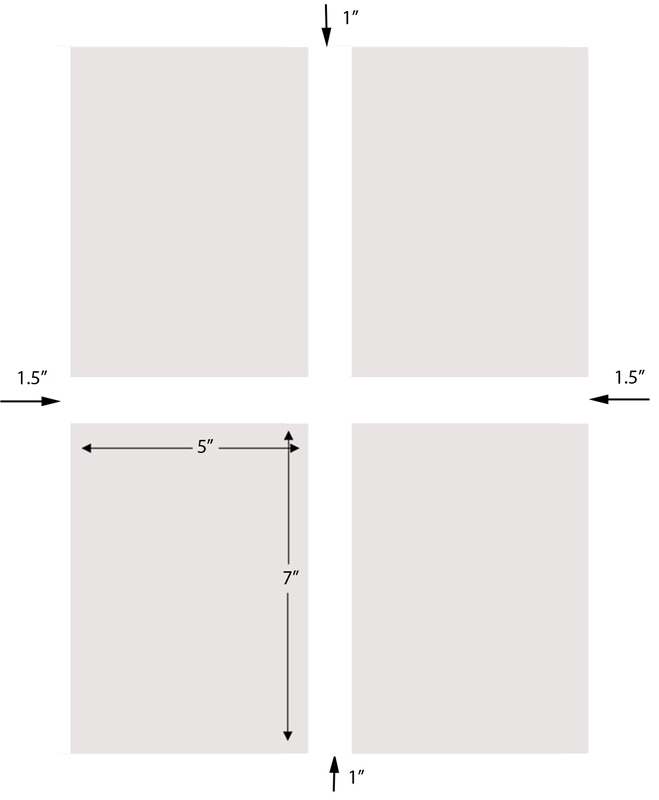 On a sheet of 9×12″ Bristol Board, measure with your ruler 6 rectangles (3″x2″). There should be a 2″ margin on the sides and a 1″ margin on the top and bottom. Between each rectangle there should be a 1″ margin. NOTE: Adjust the orientation of the page, if your thumbnails are horizontal. Based on the critique, choose the 6 most successful pencil thumbnail drawings that exhibit unified compositions. In your Creative Process Book, redraw these 6 compositions, transforming lines and points into simple shapes. The goal with these is to simplify, pare down the designs to create (3) obvious figure / ground relationships and (3) ambiguous figure/ground relationships using only solid closed shapes. The shapes can be organic or geometric. Once you are happy with these compositions transfer them to the Bristol Board using pencil first and then pen to fill in black areas. Erase all extraneous pencil lines and measurements. Final piece should be neat, clean and well-presented. REFERENCES: In these two examples notice the consideration of the figure-ground relationship and how it unifies the overall composition. 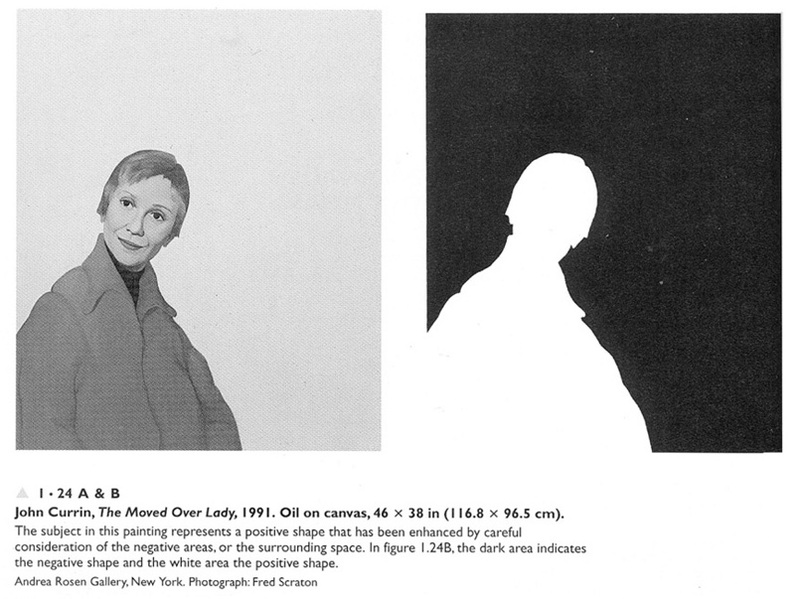 STUDENT EXAMPLES: Can you determine which image demonstrates Obvious and Ambiguous Figure/Ground? And why? Are they all successful or could some be improved? How? Using your inked thumbnail compositions as a guide, create 4 figure-ground relationships (2 stable, 2 ambiguous) using black paper cutouts. With subtlety and economy, see if you can re-create your compositions to communicate an emotion or concept, such as tension, loss, power, weakness, silence, energy, etc. Ideally the content (meaning) should relate back to your experience of observing the view from your window. These 4 compositions should be a culmination of the creative process so far. They should represent your most successful attempts at this design problem. On a sheet of 14×17″ Bristol Board, measure 4 rectangles (5×7”) with your ruler. There should be a 1″ margin on the bottom and top and a 1.5″ margin on the sides. Between each rectangle there should be a 1″ margin. Adjust to your picture frames, as necessary. 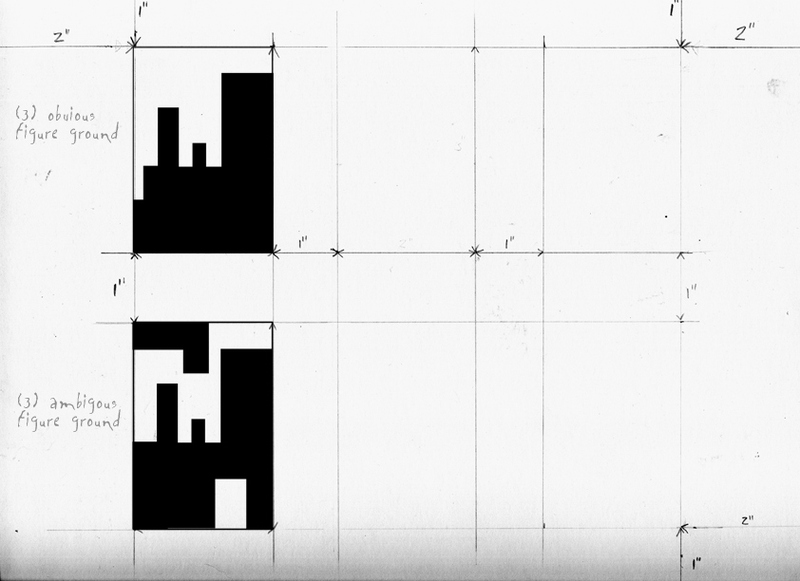 Using Black drawing paper, scissors, exacto knife, ruler/t-square, glue, cut black drawing paper to desired shapes (figure) and paste to the bristol (ground). Shift the shapes around, re-cutting different sizes when necessary, until you are satisfied that the whole composition functions in a unified way, where both the ground and figure have been considered. Bring all assignment parts to class. Be prepared to present, discuss and analyze your finished work in terms of concept, craft, what you learned, and creative process. Written Assessment: In your Creative Process Book, at the end of the View from My Window section, document your thoughts about this project. Think about what you learned, what you could have done better (planning, material use, craft), and how you will apply what you learned to your next project. In your Creative Process Book, outline the hours committed for each portion of the assignment, including dates and times. Integrate this record into the Assignment #1 section of your CPB — everything you do in your CPB should be well-considered and completed with intention and awareness.